"It all started in a five thousand watt radio station…." KBFN at 104.5 FM in Big Sky went on the air in 1997 as Fun 104, the "fun one." A promotional piece from the time described its music mix as "an accumulation of music from diverse styles," including classic rock, newer bands, an occasional classic country artist as well as a taste of upbeat big band/jazz. After varying degrees of success in its early years of operation, the station went off the air in 2002. Jeff and Susan Balding bought KBFN in the fall of 2003 and returned the station to the air as The Eagle 104.5 with call letters KBZM-FM. The visual-signal KBZM up until that time was assigned to a decommissioned United States Coast Guard vessel Dry Tortugas, O.N. 243745, and a release had to be secured from the Coast Guard and approved by the Federal Communications Commission to allow for the transfer of the KBZM call sign from the ship to the radio station. The new Eagle 104.5 debuted in our Big Sky studio in the late afternoon, the day before Thanksgiving, on Wednesday, November 26, 2003, with our song for good luck, Scotland The Brave, and a few choice words from program director and native Montanan, Colter Langan. Our first hour of programming featured the following set of "Classic hits…that ROCK!" And we were off and running . . . .
3. It's A Beautiful Day - U2 11. The One I Love - R.E.M. The Eagle was met with immediate positive reaction by listeners and advertisers alike, despite its very low operating power of some 870 watts transmitting from the summit of Lone Peak at Big Sky Resort, resulting in spotty reception in many locations throughout the Gallatin Valley and southwestern Montana in general. Engineering studies revealed that KBZM could significantly upgrade its power with a move one notch up the dial to 104.7 and approval for the upgrade was granted in early 2004 by the FCC. In late June of that year, KBZM installed a new sixty foot solid steel tower, four bay half-wave-spaced antenna and new Harris transmitter on the summit of Lone Peak. All of the new components were transported to the mountaintop, tethered under a helicopter, from a staging area behind Big Sky Resort's Huntley Lodge, a flight time of less than five minutes for a vertical climb of some 4,000 feet. The 'new and improved' Eagle at 104.7 was born on July 3, 2004, just in time for a fireworks SkyConcert in Big Sky, and a July 4th outdoor concert event the next night in Big Sky that featured John Fogerty and his band, along with the Allman Brothers Band (here's their setlist). The night of July 4th, also produced an intense thunderstorm of epic proportions between the two performances that took the new 104.7 off the air until repairs could be made the next day. 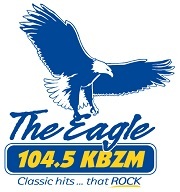 When an opportunity opened up for a new radio station in the Gallatin Valley at 105.7 FM in 2005, the Eagle signed an agreement with the owner of that new signal to operate their station as the Eagle at 105.7 and duplicated the existing Eagle's format on the new frequency. Together the two Eagle frequencies at 104.7 and 105.7 gave the stations a massive footprint and unmatched regional coverage from Lone Peak, as well as saturation into the valley's fast-growing population center including Bozeman and Belgrade on the new Eagle at 105.7. Despite their similarities the two stations are not an exact simulcast in the traditional sense (each station sends its own discrete programming stream to its respective transmitter), but they do broadcast the same songs at the same time, give or take a few seconds either way. Listeners can thus tune in to the Eagle wherever they may be in the mountains or valleys of southwestern Montana, northeast Idaho and Yellowstone National Park by simply selecting which frequency comes in clearest. Advertisers have the flexibility to choose one station or both to deliver commercial messages to a more localized (valley) audience on 105.7 and a more regional audience (including the Big Sky area) extending out nearly 100 miles on 104.7. While we refer to both stations as The Eagle, in 2006 we adopted and trademarked a new brand name, "Montana's Superstation" to better capture the essence and scale of what we are able to offer listeners and advertisers with the two combined signals. Today, Montana's Superstation is the heritage adult rock station in the region.